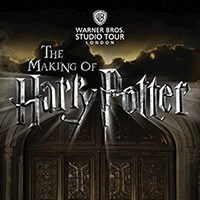 Join us and go behind the scenes of the Harry Potter set on this Warner Bros Studio Tour. Warner Bros. Studio Tour London provides a thrilling new opportunity to explore the magic of the world renowned Harry Potter film series. This unique walking tour takes you behind the scenes and showcases a huge array of beautiful sets, costumes and props. It also reveals some closely guarded secrets, including facts about the special effects and breath-taking animatronics.